DHAKA, Bangladesh, Jan 16 2018 (IPS) - With discussions underway between Bangladesh and Myanmar about the repatriation of more than a half a million Rohingya refugees, many critical questions remain, including how many people would be allowed back, who would monitor their safety, and whether the refugees even want to return to violence-scorched Rakhine state. A Joint Working Group (JWG) consisting of government representatives from Myanmar and Bangladesh was formed on Dec. 19 and tasked with developing a specific instrument on the physical arrangement for the repatriation of returnees. He says, “The crimes committed by the Myanmar regime are unpardonable and they continue to be disrespectful to the global community demanding access for investigation of alleged genocide by the regime and the dominant Buddhist community. A human right activist pointed out that the very people who are to return to Myanmar have no say in the agreement. Their voices are not reflected in the agreement which does not clearly outline how and when would the Rohingyas return home. Recently, top brass in the Myanmar regime said that it was “impossible to accept the number of persons proposed by Bangladesh” for return to Myanmar. The deal outlines that Myanmar identify the refugees as “displaced residents.” Repatriation will require Myanmar-issued proof of residency, and Myanmar can refuse to repatriate anyone. Those who return would be settled in temporary locations and their movements will be restricted. In addition, only Rohingyas who fled to Bangladesh after October 2016 will be repatriated. According to official sources, a meeting of the Joint Working Group supervising the repatriation will be held on January 15 in Myanmar’s capital to determine the field arrangement and logistics for repatriation with a fixed date to start repatriation. As of January 7, a total of 655,500 Rohingya refugees had arrived in Cox’s Bazar after a spurt of violence against the minority Muslim Rohingya people beginning in August 2016, which left thousands dead, missing and wounded. 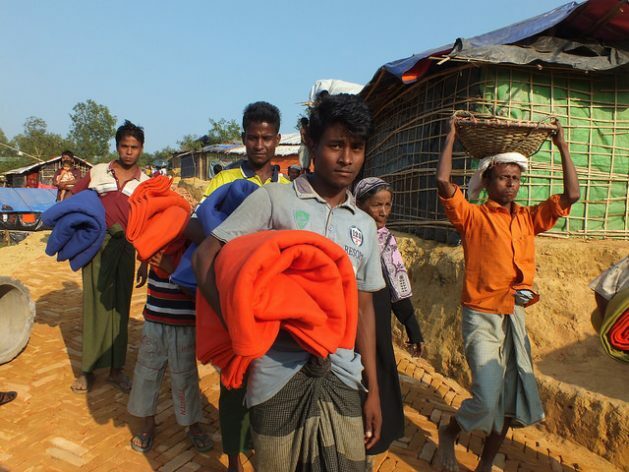 Caroline Gluck, Senior Public Information Officer at UNHCR Cox’s Bazar, Bangladesh, told IPS that the agency is currently appealing for 83.7 million dollars until the end of February 2018 to fund humanitarian operations. In March, the UN and its partners will launch a Joint Response Plan, setting out funding needs to assist Rohingya refugees and host communities for the 10-month period to the end of the year. Regarding the repatriation process, Gluck said, “Many refugees who fled to Bangladesh have suffered severe violence and trauma. Some have lost their loved ones and their homes have been destroyed. Any decision to return to Myanmar must be based on an informed and voluntary choice. Three elements of safety – physical, legal and material – must be met to ensure that return is voluntary and sustainable. She added that UNHCR is ready to provide technical support to both governments, including registering the refugees in Bangladesh and to help determine the voluntary nature of their decision to return. “As the UN Secretary-General has noted, restoring peace and stability, ensuring full humanitarian access and addressing the root causes of displacement are important pre-conditions to ensuring that returns are aligned with international standards. Gluck noted that while the numbers of refugees have significantly decreased, their needs remain urgent – for food, water, shelter and health care, as well as protection services and psychosocial help. She said UNHCR has already provided upgraded shelter kits for 30,000 families; and will expand distributions for around 50,000 more this year. The kits include bamboo pieces and plastic tarpaulin, which will allow families to build stronger sturdier, waterproof shelters, better able to withstand heavy rains and winds.